OK this picture is from the middle of February. You can tell because it is sunny and the sky is blue. It has been rather gray and dreary the last few days. 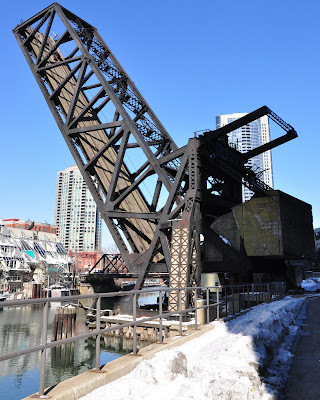 This is the Kinzie Street Railroad Bridge. I have to admit that until I took this picture and was doing the research on this bridge, I thought it was being repaired because it always was in the raised position. I did think it was a little odd that the repair was taking so long (I first noticed this bridge last year). The bridge allowed railroad traffic over the Chicago River. The main user was the Chicago Sun-Times printing plant. After the printing facilities were relocated, there was no need for this railroad bridge, so it is permanently raised. Maybe to keep people from walking on it or something?